Why You Should Do Referral Marketing - Advanced Computers Blog | NY | Advanced Computers, Inc.
Word of mouth marketing is without a doubt one of the most cost effective marketing tools available to small businesses. What’s more powerful than a satisfied client advocating on behalf of your business? Now, think about the growth potential for your business when that one client refers a new prospect and that new prospect has the same great experience as the client who referred them? The snowball effect is limitless! Referral marketing is not limited to any particular type of business, just about any business can benefit. Nothing works better in motivating people to sell your business than a referral program and it can be done without costing your business an arm and a leg. 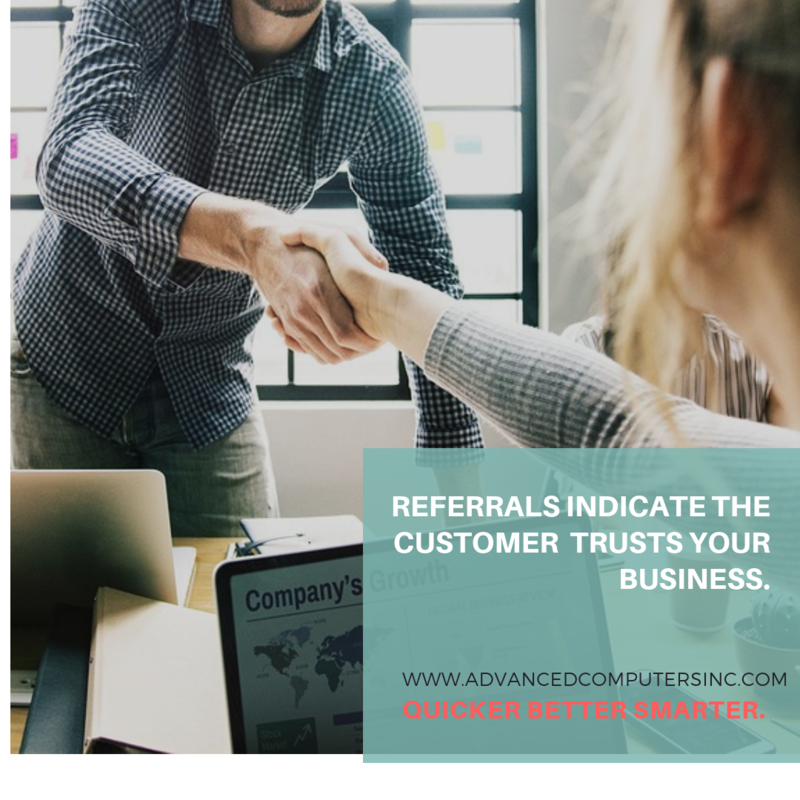 IT Managed Service Providers like Advanced Computers Incorporated https://www.advancedcomputersinc.com/it-services/managed-it-services know the power of referral marketing and we’re happy to share some of the key benefits with small businesses. If you’re thinking about introducing a referral program for your business, congratulations! You are about to make a smart business move. Here’s why. Referrals Indicate Trust—A client referring a prospect to your business indicates that the client is happy with you and wants others to have the same great experience they had, doing business with you. The prospect is also more likely to believe they will get value for money, than if they had heard about you through a general advertisement. Expands Your Reach at Low Cost—One of the biggest marketing drawbacks for small businesses is budget. Many simply cannot afford the big spend that sometimes comes with trying to attract new customers. With referral marketing, others are selling your business, and you are building brand loyalty without having to spend a fortune on an advertising campaign. A referral program also allows you to reward people for what they actually do, rather than spend blindly on marketing with potentially little or no Returns on Investment. Customer Retention—It is much more expensive to get a new client than it is to retain a current one. When current clients are happy and satisfied they will not only stay but refer others. A referral program is therefore a great idea to encourage client loyalty and motivate current clients to help you grow your business. Everybody likes to get something in return for their efforts and a referral program does exactly that. Your reward to the customer doesn’t have to be money either, it can be in kind. Gift certificates are very popular rewards for referral programs. You can also partner with other businesses to promote their products and services by offering their products as reward through your referral program. Now that we’ve told you why you should consider a referral program for your small business, you might want to check out Advanced Computers’ Referral Program. Be assured that after 17 years of expert professional service to clients ranging from top retailers to the federal government, we have built a solid reputation for being Quicker, Better and Smarter at managing IT services for small businesses. Send us a new client and get rewarded in various ways including cash and gift certificates. Click here https://www.advancedcomputersinc.com/about-us/refer-a-colleague-or-friend to refer a client to us and get a $100 gift certificate plus a bonus reward today!